Ballymena United and Crusaders will meet at Seaview on the opening day of the season. Picture: Press Eye. 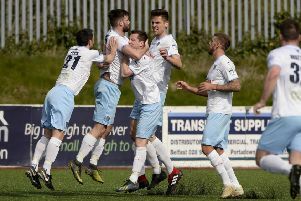 Ballymena United have been handed a tough start to the new Danske Bank Premiership campaign. The Sky Blues travel to Crusaders - champions in each of the past two seasons - in the opening round of fixtures on Saturday, August 6. The Seaview fixture is a repeat of manager David Jeffrey’s first game in charge of the Sky Blues back in March, when United earned a scoreless draw. Ballymena’s first home game will come four days later when they host Glenavon on Wednesday, August 10.